Ancient Peaks – Served up some lovely wines, my favorite was the Renegade blend of Syrah, Malbec and Petit Verdot and the Oyster Ridge blend of Cabernet Sauvignon, Merlot, Malbec and Petite Sirah. Carlisle Winery – Eve Wine 101 VP Michael Perlis is a fan so I have to try and get my hands on these wines whenever I can, usually over our staff lunches (thank you Michael). Today I was loving their Steiner Vineyard Gruner Veltliner, “the only Gruner made in Sonoma.” From there both the 2013 Russian River Valley Zinfandels wowed me: one from the Papera Ranch and the other from Montafi Ranch. 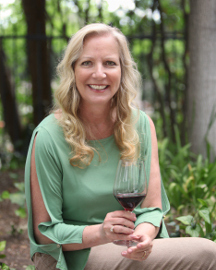 Carol Shelton Wines – From the 2011 Sonoma County Karma Zin, Cucamonga Valley (yes, as in Rancho Cucamonga) 2013 Monga Zin, 2013 Rockpile Sonoma County and through to the 2011 Late Harvest Sonoma County…I was in love with these Zins! They also had some fine wines from their secondary label, Wild Thing, and I especially appreciated the flavor of the Rendezvous Rose. Clos Pepe Estate – I’m a member of the winery, but since my shipments are usually Pinot Noirs I wanted to try the latest Axis Mundi wines made from grapes outside of the estate; the Rose of Mourvedre and blend (Grenache and Syrah). Glad I didn’t miss either, and I will want them in my next shipment. Dolin Estate – I had to turn down a wine pairing dinner with Elliott Dolin as it was in Westlake Village on a weeknight – a possible three-hour round-trip trek. I wanted to make it up by tasting them at Family Winemakers. Elliott was happy to take me through his line-up and I was especially smitten with the 2012 Malibu Estate Chardonnay and every Pinot Noir, especially the 2012 Rincon Vineyard out of the Arroyo Grande Valley. Foxen Vineyard – Starting with lovely fruit from a 2013 Chenin Blanc from the Ernesto Wickenden Vineyard, Santa Maria Valley, I also enjoyed the 2013 Chardonnay, Block UU, Bien Nacido Vineyard, Santa Maria Valley; 2013 Pinot Noir, Santa Maria Valley; 2013 Pinot Noir John Sebastiano Vineyard, Sta. Rita Hills. Frostwatch Vineyard and Winery – Poured and described by wine friend Michael Fraschilla I found myself totally digging every white I tried: the mostly Semillon 2013 Vice Versa, 2013 Chardonnay and their 2012 Ophira Reserve Chardonnay. Guarachi Family Wines – I doubted that vintner Alex Guarachi would be at the table but I had to look…and was greeted instead by his latest, and very tasty, Pinot Noir: 2013 Sun Chase Vineyard from the Petaluma Gap, Sonoma Coast. Miner Family Winery – A lovely 2013 Simpson Vineyard California Viognier tickled my fancy and 2010 The Oracle Napa Valley Bordeaux blend put me over the edge. Tasty stuff. Pride Mountain Vineyards – A delicious 2013 Napa Valley Chardonnay was followed by a 2012 Merlot and 2012 Cabernet Sauvignon, both with grapes from Napa and Sonoma Counties. Rocca Family – Yes! I was so happy to find a new favorite Napa winery that I visited last October and even happier to discover they had new releases for me to try today! There were two Cabernet Sauvignons that were delish, but a Merlot stole the show. For some reason it make me think that even a non-Merlot fan would like it; it was ready to drink now and had very nice fruit and spice. Best Merlot at the event, IMO. Swanson Vineyards – Though I was hoping winemaker Chris Phelps would be there as we dined together years ago, I was equally thrilled to say hello again to his director of national sales, Shelly Eichner. I love their wines, especially the latest Alexis Cabernet Sauvignon. Tablas Creek Vineyard – Can you ever have too many Rhônes? Never! They wowed me with every white Rhône blend, red Rhône blends and single varietals. Their 2014 Vermentino and 2012 Mourvedre were stellar. Family Winemakers of California is an “organization that reflects the small producer’s point of view.” With nearly 5,300 licensed wineries in California someone needs to consistently speak for small, family wineries in the fight for more access to markets, protecting individual freedom from government over-regulation, and fostering aspirations to make the best wine. Our beginnings are humble. Family Winemakers was founded in 1990 after the wine market order extension was voted down in a true grassroots campaign. Industry growth and public policy on a myriad of issues begged for input from small producers. One man, one vote is the bedrock principle behind Family Winemakers that guides our views on legislation, regulation, litigation and business practices. We’ve spent 24 years and counting working to loosen up the post-Prohibition restrictions in California law and broaden access to domestic markets. 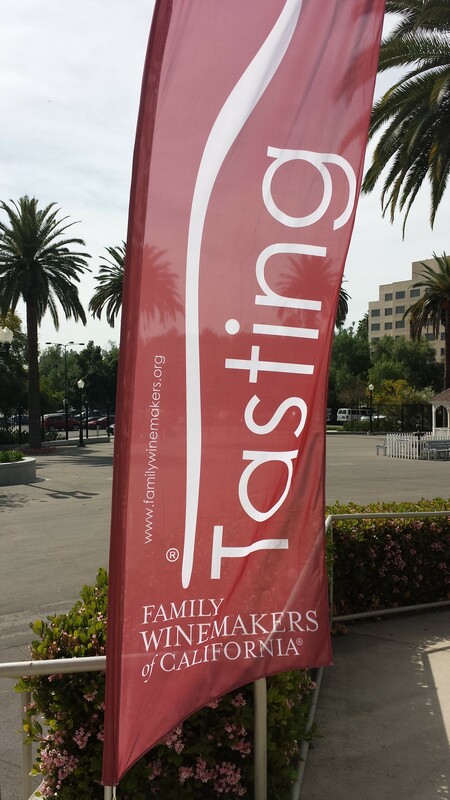 A list of the Pomona Participating Wineries can be downloaded here. Ancient Peaks – Mike Sinor is the winemaker for this Santa Margarita winery, just south of Paso Robles. My favorites were the Renegade Rhone blend and the Oyster Ridge blend of Cabernet Sauvignon, Petite Sirah, Petit Verdot and Malbec. I think these are my two favorites from them every year. BellaGrace Vineyards – A fairly new  winery based in Plymouth. Barbera is one of the things Amador County does best, and there’s was no exception. Their Primitivo was tasty as well, but my favorite was their old vine Zinfandel – not surprising as Amador boasts some of the oldest Zinfandel vineyards in California. C.G. Di Arie Vineyard & Winery – Another Sierra Foothills producer great Barbera, Primitivo and Zinfandel, along with a Cabernet Sauvignon that I really liked. Ca’Momi Winery Napa Valley – very good Zinfandel from this Napa winery. My wife Karen enjoyed their Prosecco and their Rose. Carlisle Winery – I can’t say enough good things about Carlisle. I’ve been a fan since they started in 1998, and Mike and Kendall Officer continue to support FWC and those retailers who supported them since they began, despite huge accolades and a waiting list to buy wine that is miles long. Loved their Gruner Veltliner [as did Karen], as well as the two single vineyard Zinfandels they were pouring [Montafi Ranch and Papera Ranch], and it was amazing to me how delicious their Sonoma County Syrah was – this wine is priced as an everyday wine but definitely does not have an everyday taste. Cima Collina – tasty wines from Marina, California. Liked their Syrah and loved the Mourvedre. Clavo Cellars – Neil Roberts continues to make outstanding wines out of Templeton. His whites are always great and the reds keep getting better and better. I especially liked the Zinfandel and Collusion red blend. Inspiration Vineyards & Winery – very small winery based in Santa Rosa, owner/winemaker Jon Phillips is make some very nice wines. I found his red Rhone blend to be really tasty. Mattina Fiore Wines – a new winery for me, and a pretty new one overall , this wine was a great discovery for me. Based in San Luis Obispo, as I was tasting the wine the words that kept coming into my head were “These wines are very pretty.” The only Chardonnay I had that day, and it was outstanding. Their Grenache, Syrah and Red Rhone blend were great as well. Nottingham Cellars – this was another big find for me. The winery is in Livermore, an area to which I have previously paid little to no attention. The Rhone blend was outstanding and the Petite Sirah was a dollop of deliciousness on my palate. 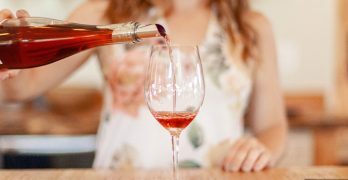 Rock Wall Wine Company – Sadly, winemaker Shauna Rosenblum did not make the trip down from Alameda this year, which is understandable since her baby is due any time now. 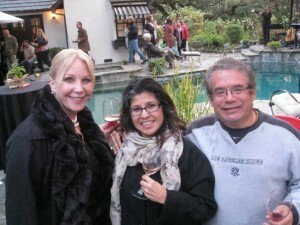 Fortunately her wines did – I’m a big fan of her Zinfandel, Petite Sirah and Tannat, as well as the Obsideana red blend. Sobon Estate / Shenandoah Vineyards – another Amador County producer, so naturally I enjoyed their Barbera, Zinfandel and Primitivo. Thirty-Seven Wines – based in Sonoma, I was really excited to try these wines, especially when I found out that Shane Finley is their winemaker. The Grenache and Syrah were amazing, as was the red blend. These wines really over-delivered – very reasonable price points and very high quality. 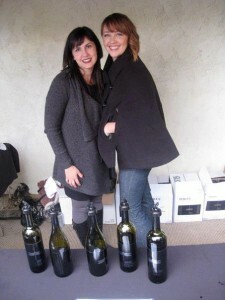 Tres Sabores – winemaker Julie Johnson is making nice wines at her winery in St. Helena. I enjoyed the Petite Sirah, Zinfandel and the red blend of Zinfandel, Petite Sirah, Cabernet Sauvignon and Petit Verdot named Por Que No? Vezer Family Vineyard – another winery that was new to me, this one is based in Fairfield. Enjoyed their Petite Sirah and Zinfandel, as well as their red blend. [Karen really liked their Verdelho.] And I liked their Cabernet Sauvignon as well. You may have noticed a recurring theme here, but not unexpected to anyone who knows me or reads my articles on a regular basis. I gravitate toward Zinfandel and the Rhones, and with the breadth of selection here, it was easy to create a tasting game plan that would meet those desires. But there was also plenty of high-quality Cabernet Sauvignon, Merlot and Pinot Noir being poured. This was truly a tasting for everyone and I am looking forward to what they do with it next year. Happy 2015, Eve’s Wine 101 fans! I hope your New Year is off to a great start like mine is, hitting the ground at a gallop. It didn’t hurt to start the year almost 100 pounds thinner than last year to begin with, but that is another story (one that includes not limiting my access to wine to lose the weight!) The best part of 2015 is starting it as I have for the last five years now, as a Wine Judge for the San Francisco Chronicle Wine Competition. This is an event that I anticipate at the beginning of every year, this year it took place from January 7th through the 10th at the Cloverdale Citrus Fair grounds in Cloverdale, California. Yes, the competition has been completed and has started another stellar year for the wine industry across the United States. After last year’s competition amassed over 5,800 entries for states all across the nation, it was anticipated that participation would drop for 2015, but at the start of judging the Chronicle Competition began with over 6,400 entries from 28 states. You would think this to be a daunting task for the 60+ judges to complete their evaluations in 3 ½ days. But, as usual the panels were up for the job and joyfully sipped and savored their way, finishing the Sweepstakes judging before noon on Friday the 10th. This competition is one of my favorites every year, as I am exposed to such a huge diverse range of newly released wine, I have the opportunity to catch up with a number of friends that I only see a few times a year and it kicks my New Year off on a great start. The competition is great in its own right, as it breaks many wines down in price range categories, this makes it so $20 Cabernet Sauvignon is not competing with the same wine at $60. 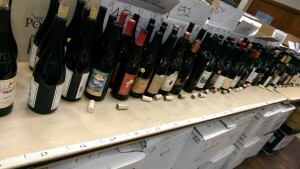 It benefits the wineries as far as medal competition, but also the consumer, who can now look for wines that are medal winners in a specific price range. Everybody wines when this happens. 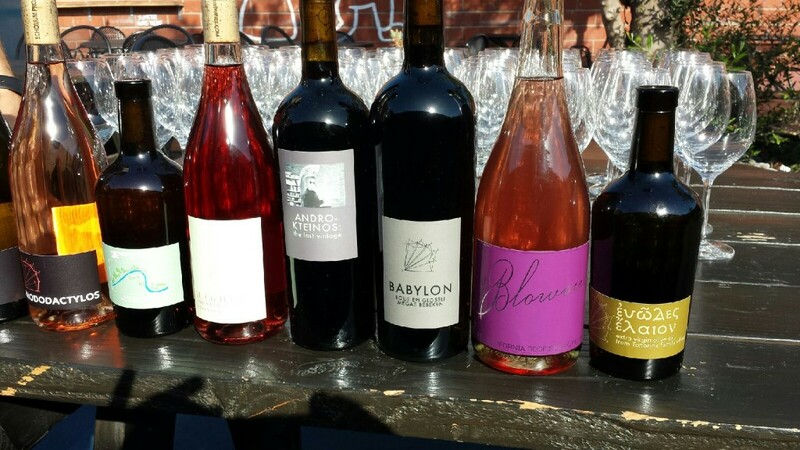 If you are curious about the medal winning wines from this year’s San Francisco Chronicle Competition go to the following address, http://winejudging.com/medal-winners/. During this week of judging, I have the opportunity to meet wine people (educators, critics, media people, wine makers and more) from all corners of the United States and share stories, wines and experiences. It is a wonderful 3 ½ days of intense tasting, camaraderie, entertainment and of course…some great food mixed in! What’s not to like when you have wine industry icons such as Wilfred Wong (formerly of Bev-Mo and now with Wine.com), Kent Roseblum (formerly Rosenblum Cellars and now with RockWall Wine Company), Dr. Barry Gump (Wine educator from Florida International University) and many more noteworthy wine industry professionals together to evaluate wine from across the United States. The competition started every morning with breakfast, except for the meet and greet event on Tuesday. This is where the judges are introduced and the panel selections for the week are announced. From that point on it is off to take the annual Judges Picture and then time to start our judging. My panel was comprised of three judges, Kathleen Arnink (Educator from Cornell University), Chris Sawyer (Wine Writer and Sommelier) and myself. This year we tasted Petite Sirah $20+, Syrah $40+, Syrah $30-$39, Cabernet Sauvignons $25-$29, Zinfandel $25-$29, Pinot Gris/Pinot Grigio $15+, Verdelho, Gruener Veltliner and a varietal called Blanc du Bois (which none of us had ever heard of prior to this event). We were quite pleased with the variety and overall quality of what we judged this year, finding some exceptional wine throughout the week. 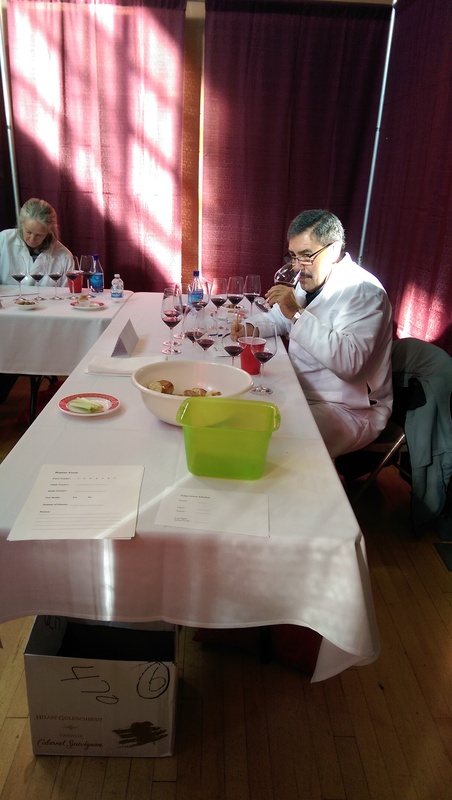 Now sitting down and tasting 120 to 150 wines a day may sound like a challenge, which it is, but being able to gather with all of the judges both Tuesday and Wednesday evenings for the Judge’s dinners makes the day all worthwhile. The Tuesday dinner is always catered at the home of the Chronicle Competition’s Executive Director, Bob Fraser. Bob and his lovely wife Carrie welcome us every year into their backyard, providing us the opportunity to reconnect with old friends, meet and get to know the new judges and generally have a fun night with wine, food and friends. The evening concluded with most of the judges heading back to the motel where they were staying and gathering to visit and sip wines in a couple select rooms. The Wednesday night dinner was a bit more formal, as it is hosted by a winery from either Napa or Sonoma County. This year we were invited to the Francis Ford Coppola Winery near Geyserville. It is a beautiful facility, laden with artwork and memorabilia from Coppola movies. Thanks to the amazing effort by our hosts, the dinner experience was fabulous. Prior to the start of dinner, we all were greeted with wine, a tour of the facility and then led into their large barrel room for the meal portion of the visit. It was well lit and beautifully decorated, with three long tables set up for family style seating and dining. What added to the experience was that the Coppola wait-staff were all dressed up as Italian characters that you may find in a New Jersey or New York neighborhood. These folks were hilarious, acting the part as they brought out copious amounts of food and wine all evening for the very appreciative guests. Topping the evening off was the presence of the man himself, Francis Ford Coppola and his lovely wife Eleanor. He spoke and welcomed everyone to his winery, leading into what I think was the best Judge’s dinner I have ever attended. The staff was amazing, keeping wine and food flowing, there was music playing and the ambiance was electric. It definitely was a memorable evening. The remainder of the competition flowed on into Friday, with the Sweepstakes portion of the judging being performed in a large room in front of an audience. The final judging segment included recognition for the staff and volunteers that are always so critical to the success of the competition, then the Sweepstakes judging. It all wrapped up after the Sweepstakes winners were announced, with closing remarks from Bob Fraser and the final portion of the 2015 San Francisco Chronicle Competition, the Public Tasting Event, being announced as taking place on February 14th at Fort Mason in San Francisco. This is a portion of the competition I highly recommend you consider if you are in San Francisco on Valentine’s Day Weekend. It is 3-4 hours of tasting award winning and other wines from across the United States, with the opportunity to meet the owners and winemakers of these great wines. It is a great event, a wonderful opportunity, plus it is a nice way to spend a special Valentine’s Day weekend. Les Deux Chat, owned by Chris and Patty Connolly, will be pouring a selection of their wines. Tomas & Jenny Lukas will share their 2007 Bobcat Red Syrah, 2008 Bobcat Red Syrah, 2008 Cab Mascari Vineyard and 2008 Luminari Zinfandel. Chris Carpenter will be pouring a 2008 Santa Inez Nebbiolo and 2008 Pinot Noir along with a 2007 “Lost Pruners” Cabernet Sauvignon. DiMaggio Washington will be pouring his Rancho Santiago 2007 Port. Danny Mascari, from his vineyard on Bouquet Canyon Road, Bouquet Vineyard, will be sharing a 2005 Cabernet, 2007 Cabernet, and 2007 Sangiovese. Susie and Kerry Clark, of Two Hearts Estate, Castaic, will be pouring 08 Lewis Vyd Petite Sirah, Lodi, 08 Two Hearts Estate Primitivo, 07 Two Hearts Estate Primitivo, 07 Two Hearts Estate Scorched Earth Syrah, 08 Two Hearts Estate Syrah, 07 Two Hearts Estate Cabernet, 08 Primitivo/Petite Blend, 08 Paso Cabernet, 08 Paso Cab/Syrah Blend, 08 White Hawk Vyd Cat Canyon S.B. Sangiovese, 08 Triunfo Creek Vyd Malibu Merlot, 07 Malbec, Argentina, South America, 09 Two Hearts Rose, 07 & 08 Gruner-Veltliner, Weingut Huber, Traisental Austria, 08 Oakville Vyd Napa Valley Sauvignon Blanc, 09 Swayze Vyd Neenach Sauvignon Blanc, 09 Swayze Vyd Neenach Semillion and 09 Swayze Vyd Neenach Sauvignon Blanc/Semillion Blends. Pulchella Winery, formerly known as Dragonfly, will be pouring 2007 lot #1 Janes Ranch Vineyard Zinfandel Paso Robles, 2007 lot #2 Janes Ranch Vineyard Zinfandel Paso Robles, 2006 Creston Ranch Farms Cabernet Sauvignon Paso Robles, 2007 Paso Robles Syrah, 2006 Paso Robles Chardonnay. Joe & Jill Fariss, of “Soaring Hawk”, will be bringing ’07 Merlot, ’07 Zin, ’08 Viogner. Their beer-master friend, Richard Gayou, will be bringing 2 seasonal beer/ale. And there will also be bits of brats served by the Assistance League ladies to pair it with! Roman is also preparing something very special, never seen in these parts of the World: “In my country it is called BURCAK. (pronounced something like this – BOURCHAUG or BURCHYAG) It is simply a wine in the middle of fermentation, poured to taste as it ferments in your glass. New additions this year include wine maker Randy Bartlett of “4 Joe’s Wines”, winemaking father-son duo Jeff & Ed Capuano and “World Wine Educator” and COC professor, professional sommelier and vineyard grower/winemaker DiMaggio Washington. Also new this year, good friends of the Santa Clarita Valley Vintners and Growers Association, Corry & Carol deRobertis. They will be offering tastes of their custom made artisan cheeses. A day of sailing out of Marina del Rey aboard Betsy & Kenny Linn’s Benteneau yacht the ‘Alcyone’, includes lunch & wine and delightful hosts. A fun auction item this year is a dinner served and made by a select group of the winemakers with select wines, as well as some rare bottles from these local winemakers. Their dinners are not to be missed. There will be gourmet raffle items as well. Raffle tickets are 10 for $10 or 25 for $20. Winners will be posted on the blackboard and will be available for pickup when exiting. “I just returned from an Assistance League Conference. 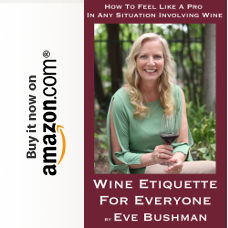 I discovered that other chapters are beginning to copy our “Sunset in the Vineyard” event as a fundraiser too. I was told it was an honor! This event helps fund local programs; one such program is Operation School Bell which allows Assistance League to buy new school clothing for over 1,660 SCV children in need at our “Shopping Event at Kohl’s”. One can imagine that the need will be much greater this year! (Washington, DC)—The new wine shipping law inserted into the recently approved Massachusetts budget continues to endorse a ban on the shipment of hundreds thousands of wines into the state. This fact that has gone unmentioned in coverage of the issue and in the bill itself, despite the American Wine Consumer Coalition, its members and others advocates alerting lawmakers to this loophole in the law in recent months. • The vast majority of non-American (Bordeaux, Burgundy, Rhone, etc) collectible and investment grade wines that are almost always sold by retailers and auction houses. “We understand that a small cup of water for the parched is better than no water at all, however there is no reason why the legislature could not have provided the state’s consumers with a full glass of water— or wine—rather than choosing to unnecessarily protect special interests,” said Tom Wark, executive director of the American Wine Consumer Coalition. By banning the delivery of an entire class of wines, the Massachusetts legislature may have made the same mistake they did the last time they attempted to address this issue and invited a constitutional challenged and lost. It would be in the best interests of the Legislature, the State, and, most importantly, consumers, to see this new law expanded to allow consumers to have wine shipped to them from out-of-state wine retailers as well as from out-of-state wineries. The American Wine Consumer Coalition is a national advocacy organization that works on behalf of wine consumers to advance consumer-friendly wine laws. The AWCC works through lobbying, litigation and educatiional efforts to advance the agenda of wine consmers. The AWCC is membership supported. Instead of attending as media during the day, this time I opted to dress up, bring my hubby, and see what it’s like to attend http://www.LearnAboutWine.com’s STARS of Santa Barbara wine tasting event at night, like normal people. I quickly discovered that the crowd didn’t walk around with notepads or cameras, so I easily got to work. The crowd was also more relaxed and less hurried, as no one was on a mission to taste everything, tweet and then get home and write about it. The one thing the guests had in common with the media is that within an hour they shared their favorites. Z Three 2010 – Loved this blend of 15% Grenache, 50% Syrah and 35% Mourvedre. 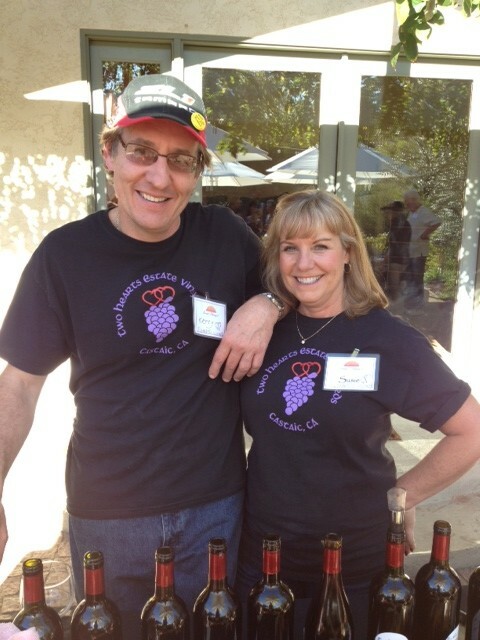 Pinot Noir, Clone 667, La Encantada 2011 – My husband Eddie’s pick. Bedrock Chardonnay 2012 – Great floral aromas, one of the few Chards I dug. Mesa Pinot Noir 2010 – A standout Pinot. Larner – A new discovery for me, in Ballard Canyon. Elemental Blend 2009 – Excellent w/65% Grenache, 23% Syrah and 12% Mourvedre. 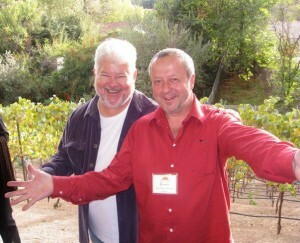 Added: 07 and 08 Pinot – Classic Wes Hagen. Trevin, Bordeaux blend 2009 – Winemaker Karen Steinwachs poured this, their latest in bottle – delish. 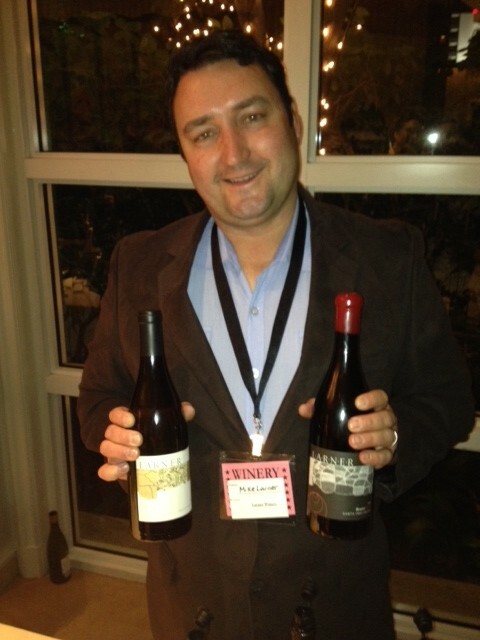 Fess Parker – Liked the reds the best, they also pour at Rhone Rangers. Epiphany Revelation, red Rhone blend, Santa Barbara County 2010 – Awesome. Cielo Rubio 2011 – A well-done Sangiovese blend with Petit Verdot, Cabernet. 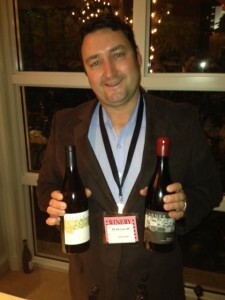 Shai Cellars – All well done by winemaker Shawn Halahmy. Always love his Adome. Adome – 65% Syrah 35% Cab 2009 – My fave of Shawn’s current line-up. Cuvee Jeanne Marie 2011 – An outstanding Grenache Mourvedre (no Syrah) blend. “foxen 7200” Cabernet Sauvignon, Vogelzang Vyd 2010 – Must visit 7200 location. Sparkling Brut 2012 – Fun, both tart and sweet. Syrah 2011 – They make 7 different Syrahs, this was great, want the other 6. Petite Sirah 2012 – A definite standout, may have been the only Petite Sirah. Solminer – Winery owner is Austrian – and a huge influence on these low-alcohol refreshing wines. Crawford – Tasting room in Buellton, off of 2nd St, and part of a new 3-winery ghetto on the horizon. Chardonnay, Tin Shack, Sta. 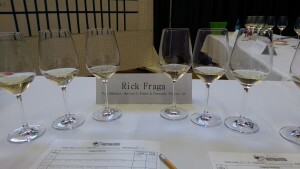 Rita Hills 2012 – Another great Chard. 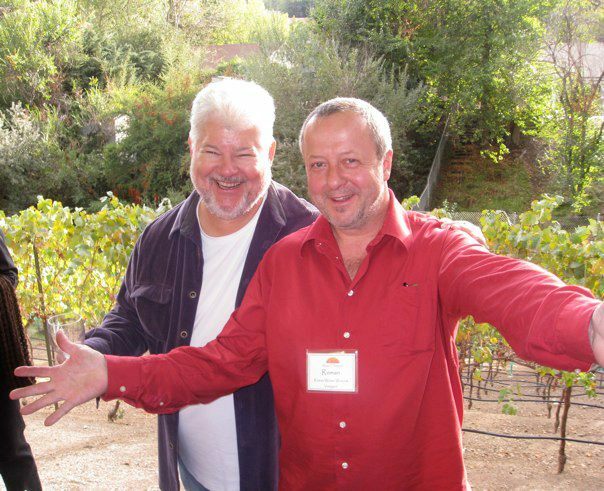 Dedicated to keeping the populous current on the great wines coming out of Santa Barbara, this Annual Tasting Event features the namesakes, owners, winemakers pouring some of the best wine made in California. Long before Sideways, LearnAboutWine was bullish about the quality of Santa Barbara wine. 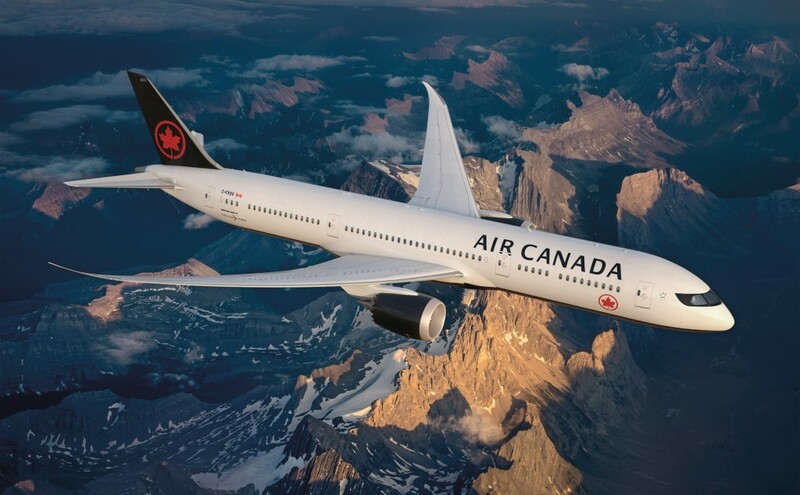 Today, with number of brands doubling in the past 10 years, the story is continuing to evolve. Tasting areas like THE FUNK ZONE continue to elevate the Santa Barbara tasting experience. New Appellations like Happy Canyon, Buellton, Los Alamos and further refinements coming, Santa Barbara is remaining topical and improving with each and every vintage. Come see the story first hand at Stars of Santa Barbara. THE INVITE: Long before Sideways, LearnAboutWine was telling their audience that Santa Barbara winemakers are producing some of the best wines in the world. 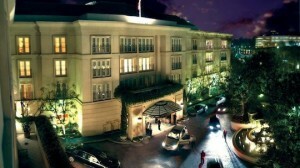 We invite the “Best of the Best”, “the brand standards” and “the newest and most up and coming” to our participate in the 10th Annual STARS of Santa Barbara at the 5 STAR and 5 Diamond Peninsula Beverly Hills, on January 23, 2014. Prices will go up as event fills to capacity at 150 guests.